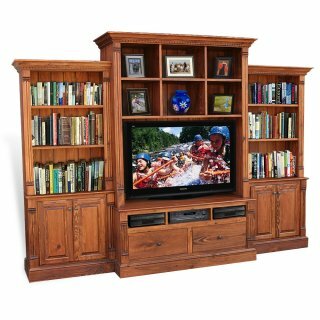 Our Cypress Wall Units make great additional to any living or family room. We offer our Wall Units in any of our Signature Styles. Our units are based on the center piece which we offer in 4′, 5′, 6′ and custom sizes. The side pieces are available in 12″, 16″, 24″, 48″. The 3 Pc TV Wall Units are our most popular designs. Just let us know the TV size you need to fit and your storage needs and we’ll come up with a size and design for you.